Why in the Left's re-writing of history is imperialism purely a Western tradition? There's a particularly ludicrous piece in the Guardian today about Prince Harry's photograph of a Losotho herdsman in traditional dress. It is described by the author of the piece as "a specious salmagundi of complacent assumptions and frightening arrogance." "It may seem harsh," says columnist Jonathan Jones, "to accuse a young man who is seen here taking a sensitive portrait of one of the people helped by his charity of posing like a Victorian imperial monarch next to a colonial inferior. But that iconography is undeniably present." Oh, for goodness sake. But leaving aside the general idiocy of the complaint, there is a deep and enduring lie at the heart of it that is central to the prejudices of the ideological Left. The lie is that imperialism (and with it, racism) is something unique, and uniquely evil, to the Western tradition. While there's obviously a mixed picture to contend with, Western empires probably brought more lasting benefits than most to their subject peoples. The British Empire, for example, was the first imperial construct in history to abolish slavery, a practice that had gone on for millenia, and a practice with a far longer track record perpetrated by non-whites than whites. A perverse Leftist racism against black women? But just to nail the point about the long history of non-Western empires, here is a brief list to be brought out when any of our Leftist friends start ramping up the ideologically-charged rhetoric about the West and imperialism. Look, the list goes into the hundreds, and I'm not going to waste your time listing them all, even if I could. 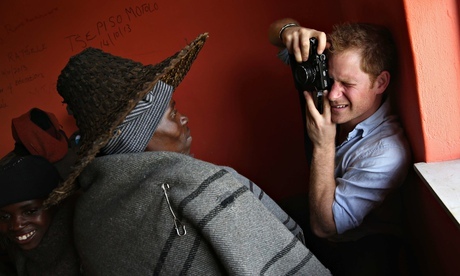 The only thing Prince Harry has got to worry about is whether he took a good photo. And if some half-witted Guardian columnist has never read any history, that's his problem.